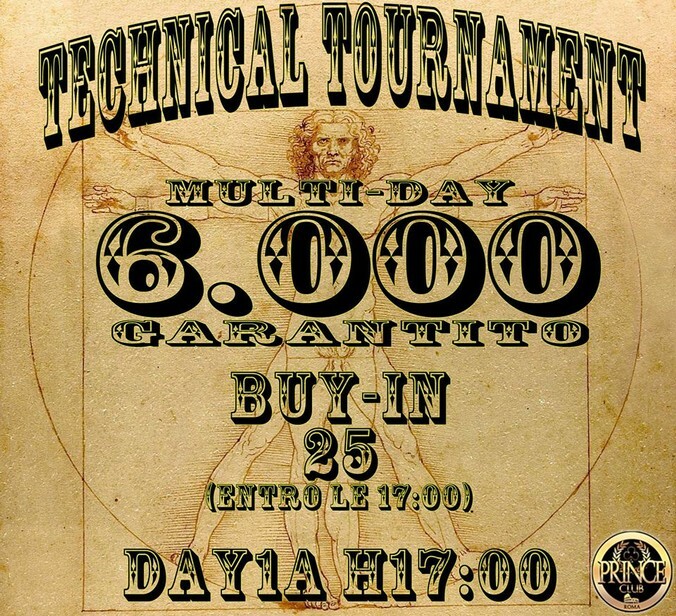 PRINCE POKER - TECHNICAL TOURNAMENT 6.000 GARANTITO - LAST CHANCE - Texas Holdem Poker - Tornei Live di Poker a Roma. IL MULTIDAY CON IL BUY IN PIU BASSO E LA MIGLIORE GIOCABILITA'! SE ANCORA DEVI PROVARLO COSA ASPETTI? FINO AD OGGI 160 (115 ENTRIES + 45 RE ENTRIES) PARTECIPANTI....E SOLAMENTE 25 DI LORO QUALIFICATI AL FINAL DAY ! SFRUTTA QUEST'ULTIMA OCCASIONE E GIOCA IL TUO MIGLIOR POKER CON UNA STRUTTURA UNICA! LAST CHANCE E FINAL DAY TUTTO IN UN GIORNO ! FINAL DAY MARTEDI 15 MARZO H 22.45 ! DURANTE I DAY1 SI GIOCHERANNO 15 LIVELLI DA 20' ! IL FINAL DAY SI GIOCHERA' CON LIVELLI DA 25' ! STRUTTURA DALLA MASSIMA GIOCABILITA' CON TUTTI I LIVELLI INTERMEDI ! con in palio un montepremi garantito di 1.000!